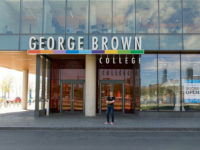 Post Tagged with: "george brown college"
Earlier this year, I posted the results of an access to information request to George Brown College (GBC) that sought to explain how the college came to publicly support the FairPlay website blocking proposal at the CRTC. 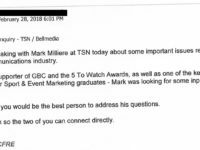 Much like similar documents from Brock University, the George Brown College documents showed a request from Mark Milliere, an executive at Bell-owned TSN, about a week before the deadline sparked the submission. The resulting letter, which came from GBC President Anne Sado, was cited by the Bell-led coalition in its reply letter to the CRTC. How did George Brown College President Anne Sado come to write a letter in support of the Bell coalition website blocking plan? Given the prior reports on Bell’s internal astroturfing campaign and the pressure on a Brock University executive (subsequently distanced by the University) it will come as little surprise to learn that the origins stem from direct Bell lobbying. According to documents obtained under provincial access to information laws, Mark Milliere, TSN’s Senior Vice President and General Manager (part of Bell Media) relied on the same playbook as with Brock University, citing its support for the college and urging it to write in support to the CRTC. The request included sample letters from Brock and Ryerson University (more on Ryerson in a forthcoming post).